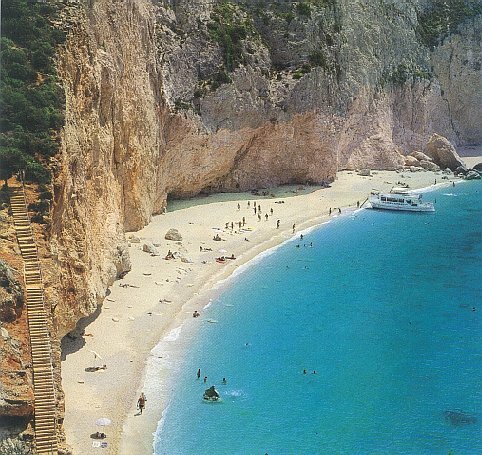 Lefkada, Leykada, Leukada, Lefcada, Leycada, Leucada, Ionian Islands, Greek hotels: Greece travel guide. Greek islands Greece. The remenants of human life in Lefkada are placed in the Neolithic Era. Its first inhabitants were the Televoans and Lelegians. Excavation finds at Nidri and elsewhere, led the German archeologist Wilhelm Darpfeld to the conclusion that Lefkada is Homer's Ithaca, the homeland of the crafty Odysses. Darpfeld supported this theory with great passion and formulated it in his book "Alt Ithaka". He himself lived a great part of his life on this island and he died ans was buried there, for that was his wish. The presence of Lefkada during the historic times, has been great and dynamic. The Corinthians conquered Lefkada in 7th Century B.C. In the 8th Century B.C., she took part in the wars against the Persians. During the Peloponesian War, she was an ally of Sparta and fought against the Athenians and Thebands. In 197 B.C., the island was conquered by the Romans. Later on (1204-1293), it formed part of the Kingdom of Epirus. 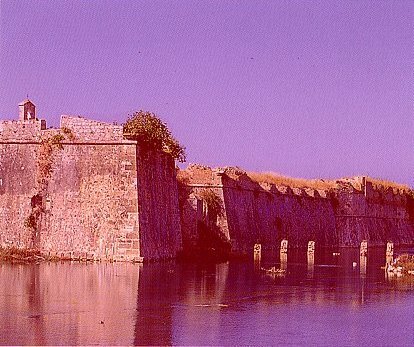 Afterwards, it came into the possession of Orsini (1293-1331), who fortified it with a fortress that still exists. Then successively, it fell into the hands of the Andegavians, Gratiano Giorgi (1331-1362) and the Toccans (1362-1479). In 1479, it was conquered by the Turks. In 1684, it was taken by the Venitians, in 1797 by the Republican Frenchmen, in 1799 by the Russians and Turks, and in 1807 by the imperial Frenchmen. In 1810, it fell into the hands of the British, and in 1864, it was united with Greece, together with the rest of tne lonian islands. Cultural Tradition: Lefkada is a small and poor place. But its cultural tradition is its great glory. Today Lefkada is the first place in Greece as far as cultural dynamism is concerned. 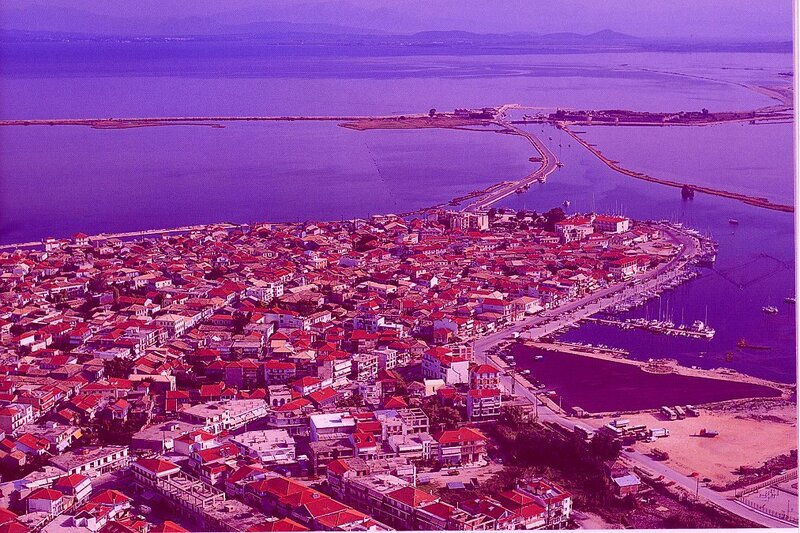 There are many people from Lefkada who distinguished themselves in the letters, the arts and sciences. It is worth mentioning two indicative names of our letters: our national poets Aristotelis Valaoritis and Angelos Sikelianos, both of them born and raised in Lefkada. Quick Tour: There are many daily transport connections with Athens (400 kilometers away). One a week, it is connected with Patras by ship and by air with Athens through Aktion. The beach at Gyra at the entrance of the island (1200m. from the city) pure white and endless is one of the most beautiful in Greece and fascinates the visitor on site. The county of Lefkada includes the capital of the island, Lefkada or Hora (pop. 7.500 inhabitants), has a well organized business life. In August, when the well known "Speech and Art Festival" takes place there, life becomes cosmopitan. There are hotels, but also rooms can be rented. Here are some sights of the town: the Venitian Fort, built in 1300, the Public Library where the Museum of Post-Byzantine Art is housed, the Museum of Popular Art, the Historic Archives, many churches with interesting iconostases (reredos) and icons painted by painters of the seven lonian Islands, the homes and busts of the poets Valaoritis and Sikelianos. Three kilometers south-west of the town, is the famous Monastery of Faneromeni with an excellent view. One kilometer north-east of the town, at Kalligoni, one finds ruins of Nirikos, ancient capital of the island. Liga (4kms. from the town). It is a setlement with a wonderful sea and fresh fish. Nikiana (9kms.) It is a seaside settlement. There are restaurants and rooms are rented there. It has a nice sea for swimming. Periyali (15kms). It is a small settlement, a little way before one reaches Nidri. At the place Passa, near this settlement, one can ei; v the sea and cool water of spring with the same name. Nidri (17kms). It is a seaside village with an organized tourist substructure. Here Darpfeld, made excavations, looking for Homers' Ithaca. His bust is here, and opposite, at Aghia Kiriaki, next to the waves, is his grave. 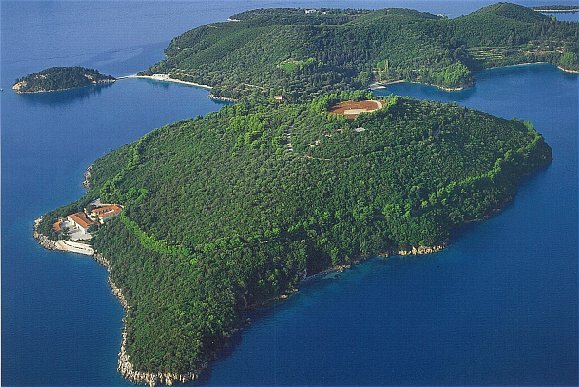 From Nidri, one can go across to the islands of Scorpios, Madouri, Meganissi etc, with a small motorboat. Rooms are rented here, and there are hotels and many restaurants. Mikros Yalos (31 kms) It is a bay and a place below Poros (a picturesque village with courteous people), a golden beach, camping sites, restaurants etc. Sivota (33kms) It is a fishing village at the bay with the same name. According to Darpfeld, it was here that Odysses came ashore after his fifteen year adventure at sea. Vassiliki (38kms) It is a picturesque village south of the island with a nice harbor, hotels, restaurants and a very clear sea for swimming. Using a small motorboat, one can go to Lefkata from here; it is the legendary cape of Lefkada where, according to tradition, Sappho committed suicide because of love. Apollo of Lefkata was worshipped here in antiquity. Sivros (32 kms) It is a village five kms. to the right of the circular road (towards Vassiliki). It has plenty of water and an lush vegetation. There is a small hotel and rooms are rented here. Aghios Petros (36 kms) It is the second village in size on the island, located on the circular road It is also a rich village. One can easily go down from here to Ponti or Vassiliki, for swimming. Rooms are rented here. Karia (14kms). This is the largest village of Lefkada at the northern part of the island. It has much water and a wonderful square, shaded by large plane trees. The excellent and greatly prized "corsanic" emproidery, is made here. Agios Nikitas (12kms) It is a picturesque fishing village on the western side of the island. Its beach is the best in the island. Other villages that a traveller should have in mind are, Sfakiotes with the famous "Frquot; well, Drimonas, Exanthia, Hortata, Atharti etc.